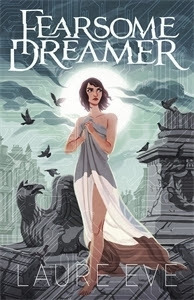 Fearsome Dreamer was one of the best Fantasy/Dystopia novels I have read this year! It has a hugely ambitious, and imaginative concept, with interesting characters and excitement. The world-itself was something that, despite sounding complicated in the initial few pages, I soon immersed myself in. Through the eyes of our three main protagonists, World and Angle Tar, were opened-up, and I thought this was a brilliant debut! I highly recommend it to anyone looking for a book to loose themselves in this Winter! In simple terms, I wanted to spend all-day just sitting and reading this book. The writing was beautifully-descriptive and moved-the-plot along effortlessly. Eve wrote from three narratives, those of: Vela Rue, White and Frith, all with completely different voices and personalities. Vela Rue has had strange dreams all her life - and had a fiery personality, that could even be a little hot-headed. I loved reading from Rue's perspective - even in those moments she was insecure, and in those where she knew she had something special. White - when I said 'interesting characters' it doesn't come close to describing him. His personality changes with what he experiences - sometimes he comes across cold and blunt - other times you get to see him lost and struggling. He had so many layers - and complicated would be an understatement when describing him. There was also a man called Frith - he was intriguing, to say the least. You know there is something-else, something about him that is hidden, and the characters know this too. Yet, he is who they confide in. Eve certainly knows how to keep us turning-the-pages! The world-building was detailed and descriptive; endlessly making us ask more questions and want to know more. Everything Rue and White know, it's not the truth. There is more to what Eve has created than what meets the eye. When I first picked up this book, I was expecting it to be good, but it beat my expectations. Plot-wise, it's gripping! You are constantly finding out more and never really know where it will go next. There are sub-plots too - all of which you are able to follow, with no confusion. The only reason this is not a five-star is because I felt there were some moments when the tension fell, but only for a few pages. There is one part of this novel I thought was so wise on Laure's behalf; the concept of Life. People in World jack into Life - which basically means they were living in a fictional, made-up place, that was so much better than reality. Inside Life, the streets that are grey and with hardly-any-life in reality, are colourful and bright. The reason I connected with his book so much, is because, I could how Life could be our future. Underneath the Talent that Rue and White possess, underneath the secrets and shocks, underneath all of that, was a World not-so-far from our own. A future that could easily be ours. Every aspect of 'Feasome Dreamer' was so well-thought-out and all of the detail, worked. I've read books where it can be too much to comprehend, but for Eve, it all comes-together. I, for one, have always been interested in dreams but, this novel takes that interest to a level where I'm already waiting for the sequel! Pick up this book - or your missing out! I'm so excited for it; I want to read it already! Thank you, Maya!